NOT SUITABLE for in-car use. From birth to around 10 months (0 -10 kg). With its leightweight chassis and its Graco Junior Baby car seat, the Graco Evo travel system is easy to use with its one-clic system to lock it on the pram. 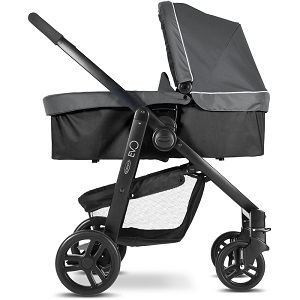 With the Graco carrycot on it, the pram will allows you long walks in Paris, with your little one lying flat in his pram. Graco Evo is particularly easy to manoeuvrate on the street. The chassis folds in a very compact way once back home, it will be easy to store in your appartment. And you'll be able to carry baby to your appartment without having to awake him. Andrea (infant crib, bouncer and pram): ¡Muy recomendable! Los productos prácticos y en perfecto estado. El servicio eficaz y amable. La perfecta ayuda para el viaje con tu bebé.